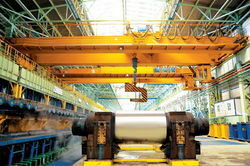 Leading Manufacturer of heavy duty cranes from Ghaziabad. We offer Extra Heavy Duty Crane.We are reputed as one of the dependable heavy duty girder cranes exporters from india. The double girder extra heavy duty cranes offered by us are extensively demanded in the market due to its applicability in handing fertilizers rock phosphate, cement, slag, iron ores foundries and similar bulk materials.